Dunno, but that right hand leg looks well dodgy, wont last 5 minutes. Doug wrote: Dunno, but that right hand leg looks well dodgy, wont last 5 minutes. Artistically placed in space Doug. Rails omitted as I was in the middle of a cheese sandwich. Feel a severe thirst building up for tonight. http://www.fretworks.co.uk/. 2D & 3D CNC Router - Laser cutting and engraving. modernist wrote: Rails omitted as I was in the middle of a cheese sandwich. modernist wrote: Feel a severe thirst building up for tonight. I know the Rietveld one thanks Paul but this was Danish often with chromed steel underframe and legs. Thinking about it my original may have been glass and chrome only. Still can't find it though. It is ruthlessly logical - given the problem of how to make a viable table from scrap boards all the same section. Odd how I seem to have strayed unwittingly into Rietveld land. I agree with your comment - if that is what you want. I'm going to draw up my idea properly (so as not to fall yet again into the design as you go trap) and get some ABW in stock to go with the sycamore already here. I was thinking last night I may use square stainless tube for the frame, which also happens to be in stock. ABW top caps on the legs and sycamore top finished in something non-yellowing (ish). Sounds good to me. I don't think I've come across this one before but thanks for making me look cos it is always fun. Poul Kjaerholm by Fritz Hansen, PK61 table. I think. jake wrote: I don't think I've come across this one before but thanks for making me look cos it is always fun. 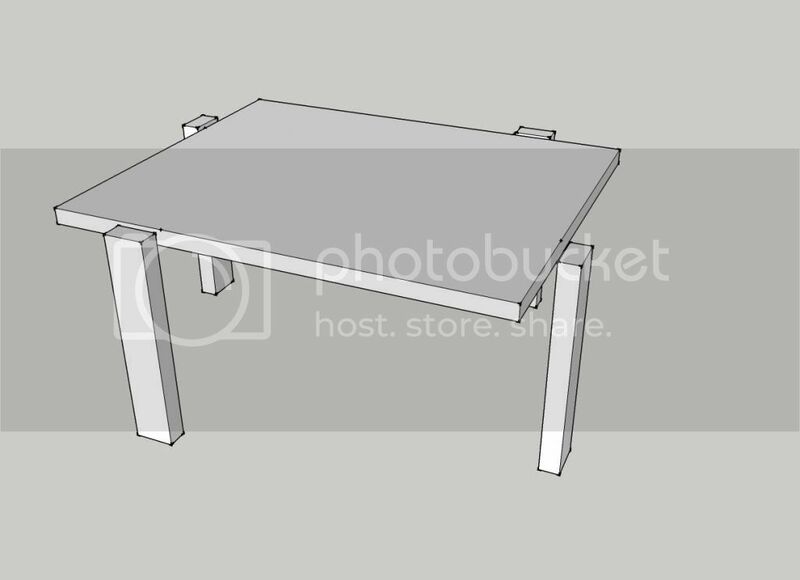 Poul Kjaerholm by Fritz Hansen, PK61 table. I think. I just knew you'd know. Thanks that is it. HTF could you find it and me not? especially as I knew what i was looking for and you didn't. Now all I have to do is work it out in wood. EDIT Now I see the legs are in the same plane as the frame (and not as I'd drawn it) then it's straightforward. Having now seen seen it, I think it looks best in glass and steel, but is pretty good in steel base with wood top. Wood base and glass top might be good, but it would have to be something really stark - blackened oak or something, I think. I agree (I tried the asymmetric danish tack without success) but I think it may not fit in with the existing furniture. 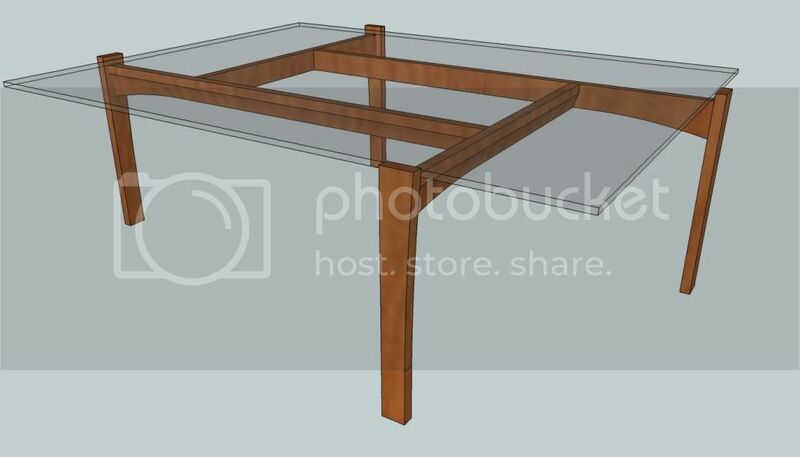 I was thinking of just using the basic idea of the leg frame with contrasting timbers e.g sycamore top, dark legs. I'll draw it out. wow.. Nice information and ideas. I really like the coffee table. coffee table is a very important piece of furniture. Living room and family room coffee tables are used differently, and family room coffee tables get more rough use. Keep that in mind when selecting a coffee table. This is the current state of play, not yet finalised. You need to use a decent wood grain material if you're going to use one. Or at least scale the one you used to the correct size.